Kell Brook believes he’s had just the type of relentless sparring he needs to be ready for challenger Sergey Rabchenko, on Saturday. 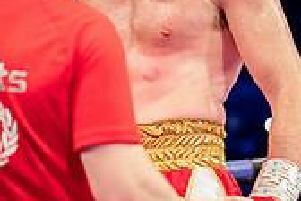 Sheffield’s former world champion has been pounded by Liam Williams, Jason Welborn and Jason Quigley at the Ingle gym, as he prepares for the Belarusian hard case. Welshman Williams, 25, has a 16-2-1 record and was a WBO world title contender only to be beaten by Liam Smith. Son of the Midlands Welborn, 31, has competed for the IBO Continental and won the WBC international silver trinket and has a 22-6-0 form chart. Then there is unbeaten Irish middleweight Quigley, 26, (W13) who has brought a breath of fresh air since arriving at the Wincobank gym. They are all a handful - a chain gang of power and speed which has presented Brook with just the sort of challenge he needs as he moves up from welterweight against Rabchenko, who is 32, at Sheffield Arena, on Saturday. “I have been sparring with guys who have certainly been testing my eyes out” said Brook, a reference to the fractured eye sockets received in his last two fights against Gennady Golovkin and Errol Spence Jr.
Brook says he has enjoyed the run-up to Saturday’s showdown. “With new characters in the gym we seem to have raised the bar even higher than before.